A few weeks ago I drove down to Elmira, NY to pick up a friend before heading to Baltimore for their annual comic book convention. We ran through the typical routine of organizing our comics by author/artist/inker, ranking the order in which we’d like to meet the different guests, and ensuring that we had enough water bottles and clif bars to survive the 8 hours of nerdy wandering. Upon closer inspection it was determined that Chris was lacking in the comics department so we decided to drive down the road to the Heroes Your Mom Threw Out Comic Shop. Here we pilfered through back issues to ensure that he had the missing Jason Aaron, Scott Snyder, Stan Sakai, and Barry Kitson items needed for the signature hunt. While checking out I started to discuss Elmira’s Hero Bot Con with Jared, the owner of the shop. We discussed the different guests and I suggested he contact me to see if I could find a few local people around Syracuse that may be interested in attending. I handed my business card to Jared and he instantly glanced up at me, put out his hand for a shake, and said “I’m so glad I finally got to meet you.” I mechanically shook his hand as I slowly came out of my state of shock. He explained that he was familiar with my documentary, animation, and goofy illustration work and would like me to attend the convention as a guest. 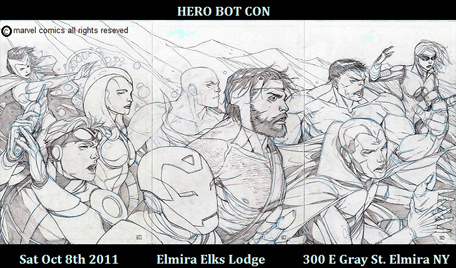 So with that said, I’d like to announce that I will be a guest at Elmira’s Hero Bot Convention. The guest list is awesome and the only cost to enter is a donation to the Elmira Food Bank. Khoi Pham – Secretly known as one of “Marvel’s young guns” Khoi has worked on Mighty Avengers and Incredible Hercules. You know he must be cool because he also shares a birthday with Antonio Banderas and yours truly. Ken Wheaton – Inker for the Simpsons, I Dream Of Jeannie, Popeye Picnic, and Negative Burn comic book series. He is also featured in my Ithacon documentary which can be watched under the Doc./Video Art section of my website. There is also a really nice list of different mini-comic creators and graphic artists who will be present. Plus, there are more to be announced! If you’re around the area please stop by. All of the artists will “wow” you with their talents and I’ll be showcasing my animations, sketching for anyone brave enough to give me a sheet of paper, and creating exquisite corpses with anyone who is up for the challenge. I will also have limited prints, hand decorated vegan brownies, stenciled patches, and possibly even some one of kind skateboard decks for sale (all created with my blood, sweat, and piano hands). I can’t even begin to explain how excited I am for this event. P.S. I’m going to start posting more sketches that I’ve done recently to show you what sort of images you can expect from me at the show. Check back and see what shows up. 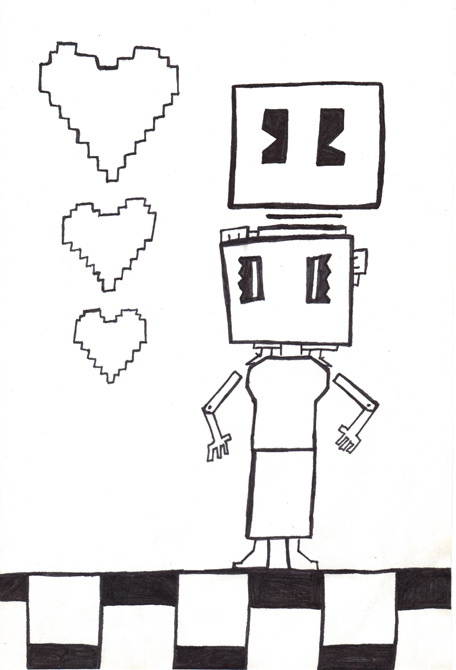 Pingback: Ryan Zlomek » Make Art Everywhere. That’s An Order.